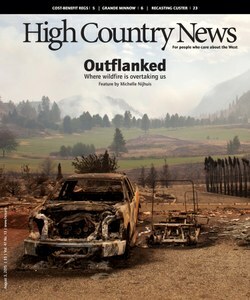 A series of stories about the way we think about wildfire in the West. 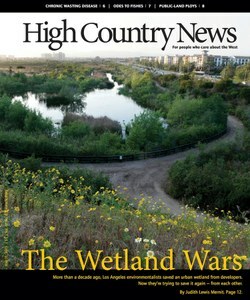 Plus, a vanishing Rio Grande fish may foretell the river's fate; the Supreme Court wants the EPA to consider the costs of new regulations as well as health benefits; and more. 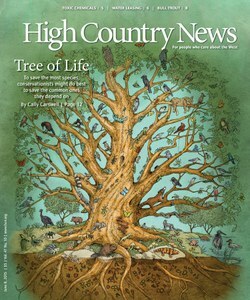 How genetic research on common species could be the key to saving the greatest number of plants and animals. 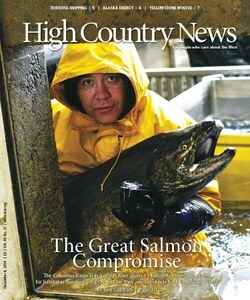 Also, a bull trout comeback, innovations in agricultural water leasing and an ode to morel hunting. 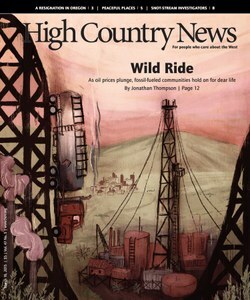 Cover Image: Original illustration by Bryce Gladfelter. 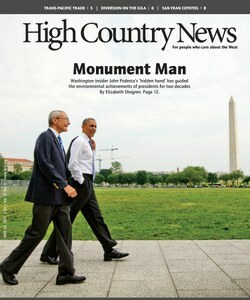 A profile of Washington, DC, insider John Podesta, the Trans Pacific Partnership, and a contentious diversion on the Gila River. 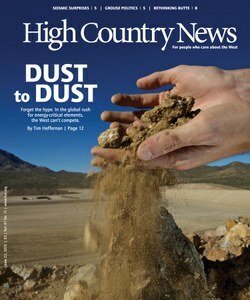 Tucson rainwater revolution, the Bakken boom closes in on a national park, a look at the West’s drought, and more. 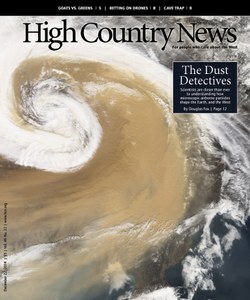 Strangers in a strange land: the HCN annual travel issue. 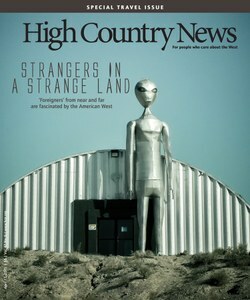 Cover image: A giant aluminum alien stands outside the Alien Research Center along Nevada’s Extraterrestrial Highway, by Finnish tourist Teemu Tuuloskorpi. 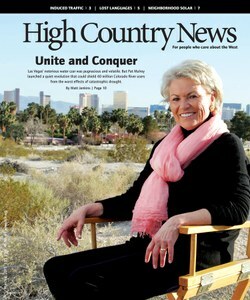 Profile of the former Las Vegas water czar Pat Mulroy, solutions to rampant dust in Owen’s River Valley, community solar comes of age in the West, and more. 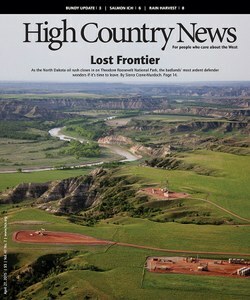 A long-standing dispute in Utah’s Escalante watershed comes to a head, wastewater spills in North Dakota oilfields, a statistician looks at the future of the shale oil boom, and more. 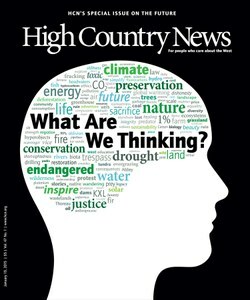 Public land access problems frustrate hikers and hunters; why greens are mad at the California governor; how balanced rocks can help us predict earthquake risk; explorations in an urban wilderness. 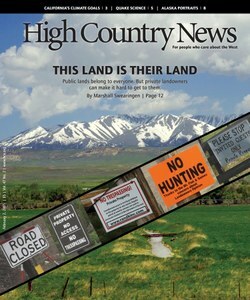 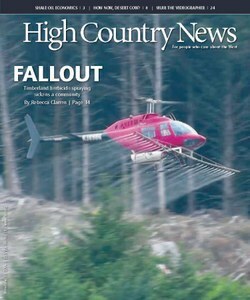 A High Country News special issue on the future of environmental ideas. 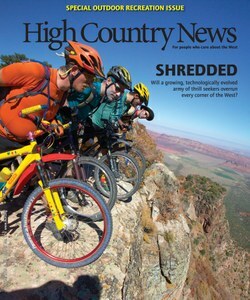 New research from dust experts, non-native goats in the La Sal Mountains, new drone laws, Navajo Nation presidential election and more. 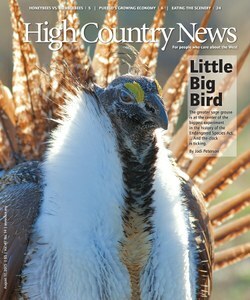 A massive compromise to save Columbia Basin salmon, Gunnison sage grouse gets protection, pet tortoises still threaten wild ones, and a fresh look at wolves’ impacts on Yellowstone. 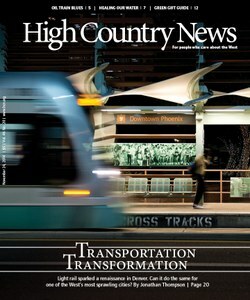 How light rail could transform Phoenix, the man who invented floating island to revive an ecosystem, and the tough questions that crude-filled trains raise in the Pacific Northwest. 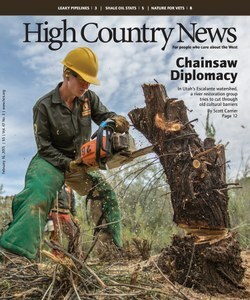 Timberland herbicide spraying sickens a community in Oregon, a look at why the current drilling boom is more sensitive to price fluctuations than its predecessors, California's sweeping new groundwater regulations, a desert-friendly cow and more. 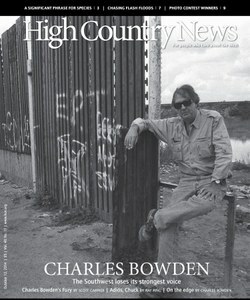 A profile of the late Charles Bowden, the Southwest's strongest voice. 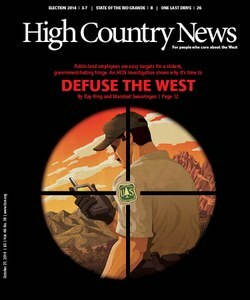 Plus, utilities experiment with real-time response in the Pacific Northwest, and an obsessive flash flood chaser improves forecasting in Utah.